441, Lot: 263. Closing Apr 03, 2019 at 11:27:40 AM ET. GERMANIA INFERIOR. 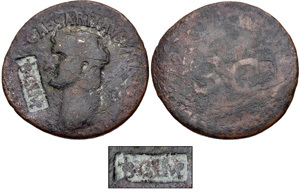 Æ As (29mm, 9.51 g). 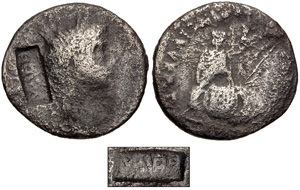 Countermark applied during the reign of Claudius, AD 41-54. 441, Lot: 285. Closing Apr 03, 2019 at 11:35:00 AM ET. IONIA, Ephesus. AR Denarius (18mm, 3.30 g). Countermark applied during the reign of Vespasian, AD 74-79. 441, Lot: 290. Closing Apr 03, 2019 at 11:36:40 AM ET. PHOENICIA, Tripolis. 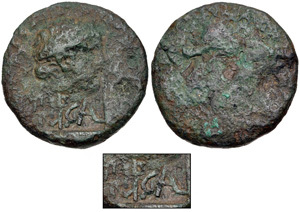 Æ (22mm, 6.73 g). Countermark applied during the reign of Galba, AD 68-69.